To celebrate this slightly auspicious milestone, we’ve got six of DC’s hottest bands who’ll be up in NYC next week, gigging and partying at CMJ. We are big fans of Crooked Beat in Adams Morgan. From the extensive show fliers and bulletin boards by the door to the prime placement of local artists in their record racks, Crooked Beat makes it clear that they are invested in the DC music scene. Red Onion in Adams Morgan is a favorite of ours. It's a little walk-in basement place with a lot of cool, obscure stuff but also a good selection of affordable vinyl. The staff is friendly and helpful, and they let you leave out your own free CDs to promote shows, which a lot of record stores won't let you do. 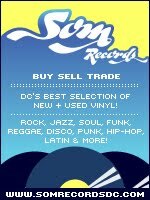 We love Som Records on 14th St in DC. Neal Becton has some choice selections and it's got a cool vibe there. The owner also does a Brazilian night at the bar next door and his music taste is impeccable. 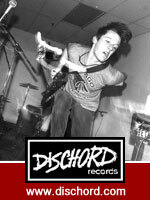 Sadly now closed, my favorite record store in the DC area was Orpheus Records in Arlington - not the coolest place nor the place to find the record to impress your hip friends. Just a massive amount of pristine classic jazz and rock records and an equally knowledgeable staff. When I first moved to DC and started buying records, it was one of the few places I never left empty handed. Our first is Joe's Record Paradise in Rockville, MD. We love it because of the number of years that its been in business (approximately 30) and it remains this hidden gem of dusty vinyls and incredible rare finds. Also, its really close to the warehouse where we rehearse and record and develop the visual aspects and samples for our show. Old vinyl is just an inspirational medium in its own right. However, since Joe's is up in Rockville, our go to place in the District is Crooked Beat. I discovered this shop shortly after I moved back to dc in 2001, and I immediately liked its aesthetic in comparison to the neighborhood in which it resides. Adam's Morgan is lively and diverse, sure... but I like that this viable, but overlooked medium is right under the noses of masses of people who couldn't be bothered with a music format if it's not quickly accessible and downloadable. The selection is great. The atmosphere is cozy. And the staff is always on top of their game. Now, you’d think after traipsing through the TVD archives this week, something OTHER than vinyl, or music even, is at work here daily. Well, not so.